The fact of the matter is, without Facebook, Binyamin Netanyahu would not be Prime Minister of Israel today. Day in and day out the press in Israel was bashing Netanyahu with everything and anything and then some. They went after Bibi's wife, after his personal life, they blamed every problem in Israel on Bibi and at times it sounded like I was dealing with anti Israel activists who blame everything on Israel. The Left wing campaign was titled "Just Not Bibi" and their entire campaign was a personal attack against Netanyahu and they did whatever they could NOT to talk about the key issues. 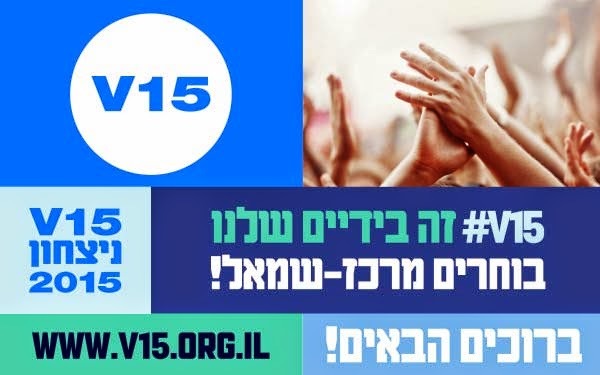 The left even recruited US activists and tax money in order to run a campaign by a organization called V-15 whose goal was to oust Netanyahu from office. US congress is now investigating Obama who seemed to know and fund this organization in order to affect the results of the Israeli election. V-15 denied that they were a left wing organization, however, their campaign which was called "Just Not Bibi" published the following advertisement that clearly calls people to vote Center and left. When it comes to the Israeli press, there are no boundaries to their bias against Netanyahu. Here is a screen shot taken by +Hillel Fuld. This is the cover page of the biggest online Israeli newspaper that is owned by the largest Israeli hard copy newspaper called, Yediot Aharonot. 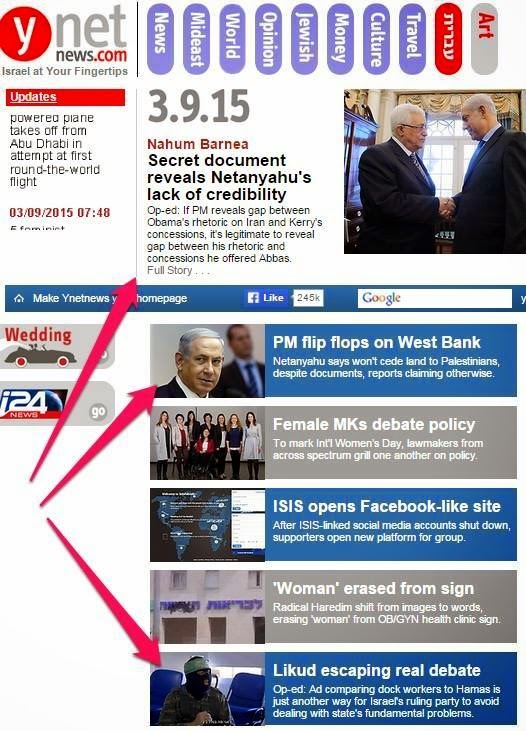 The arrows are pointing to anti Netanyahu articles that were published. This was not a one time event, this is what YNET looked like every single day throughout the elections. Endless articles against Netanyahu and others praising the opposition leaders, Buji and Tzippi. Issac (Buji) Herzog's involvement in a scandal surrounding illegal funds used for a political party was not mentioned once in the press, but Sarah Netanyahu's use of money she received from recycling bottles inside the Prime Ministers house was all over the place! Then there were the polls. 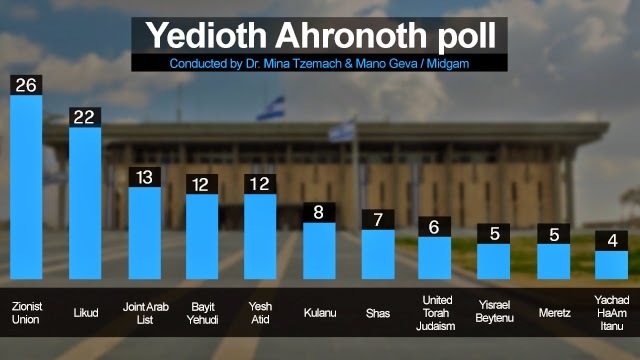 The Israeli press was constantly reporting numbers that hinted at the fall of Netanyahu and at a certain point they were reporting a clear victory to the left. At the end of the day Netanyahu came out on top. Bibi did not only win, he destroyed the left, the press and the attempt by Obama to overthrow his government. The same paper that was constantly attacking Netanyahu and predicting a defeat was forced to publish the following picture this morning. So, how did Bibi do it? Netanyahu knew that he could not rely on the press for objective coverage, all the public cards were stacked against Netanyahu. From Obama to every single TV station in Israel, Netanyahu's head was the bull's eye. Netanyahu did what anyone who wants the world to see who they are would do, he took over social media! Even during the congress speech the Israeli press was interrupting Netanyahu to put in their own commentary, but it did not help, Twitter was on fire when it came to Netanyahu's appearance in congress. Youtube, Facebook, Twitter and Google+ were screaming with Netanyahu's messages that were not being aired or discussed on official press channels. If Facebook did not exist and Netanyahu wold not have had a channel to freely fight against the messages that were being published in the papers, on the TV and radio, I doubt if he would be sitting in the Prime Minister's office this morning. What the liberal left press did in the United States to help Obama take office, simply did not work in Israel. Thank God, the population in Israel was not stupid enough to listen the biased press and instead voted for the more experienced candidate. Here are some of Bibi's Youtube hits! Help Keep The Shield Strong!Help Support Israel's Fight! To join me in supporting over 1,000 families of IDF soldiers who are in need of financial assistance click the HERE. We will be delivering special Passover packages to these families so that they can enjoy passover without being worries about their financial situation! There are less than 3 weeks till Passover, help us make their passover holiday a happy one! 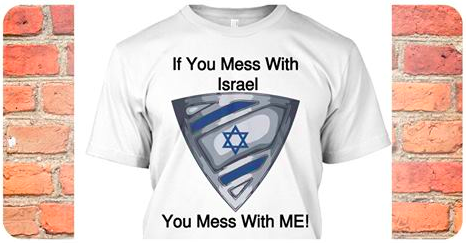 GET YOUR IsraelShield T-shirt TODAY!